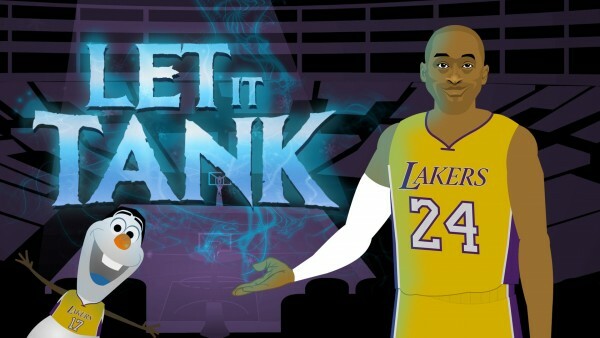 The Los Angeles Lakers are tanking, so the folks over at Bleacher Report made a nice little video of Kobe Bryant doing his best to be like Elsa, singing ‘Let it Tank’ about his career taking a dive, while his team might actually be doing better when he isn’t playing. Maybe the most parodied song of the last 12 months (there’s an excellent Arsene Wenger version), Frozen sets the stage for Bryant walking into an empty Staples Center and letting out what’s on his mind about this season, his teammates, the fans, Shaq and him never getting that sixth NBA title ring he wants so badly. Bonus? Jeremy Lin is Olaf the snowman and Carlos Boozer is Bryant’s chauffeur on the Mambacopter.